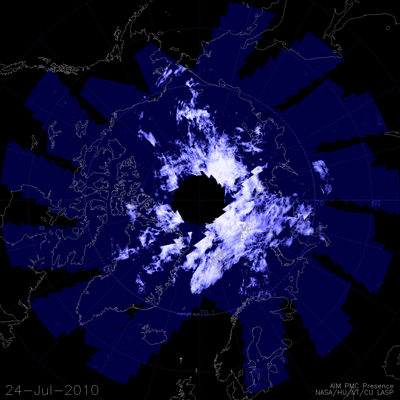 Northern Hemisphere polar mesospheric clouds, mapped from the AIM satellite in this June 21 image, can be seen from the ground when they reflect light after sunset. Scientists are not sure what has caused this change, but hope that ongoing data from AIM will further our understanding of mesospheric weather patterns. Scientists believe the timing and duration of polar mesospheric cloud formation can provide understanding about climate change and the link between mesospheric and tropospheric weather patterns.